They are currently running a contest via their Facebook page where you can enter to win FOUR of these new knives. Did you get that? FREE. KNIVES. I was given the new paring knife to try out, and the first thing I noticed was that it was very comfortable to hold in my hand. It has a nice weight, a razor-sharp blade, and worked perfectly for pretty much the only thing I use a paring knife for: eating an apple. The apple was no match for the combination of this new knife in my hands and my hungry appetite: Mission Accomplished! With its heft and ease of use, I may actually have to look for more opportunities to use this paring knife! Thanks again to New West Knifeworks for sending out this super-cool looking, very useful knife. It’ll definitely replace my old supermarket-bought paring knife, and it’s great to know that the materials are from the USA, as is the assembly and workmanship. Ah, patriotism! One of the fun perks of doing a food blog is the occasional opportunity to try out new products, be they food samples, spices, or even kitchen tools. So I was very excited when I was asked by New West KnifeWorks if I’d be interested in trying out one of their knives from the Fusionwood line: the Petty. I’d seen these same knives featured in a recent issue of Saveur magazine, and thought they looked pretty cool, and from the writeup, they sounded perfectly functional as well. 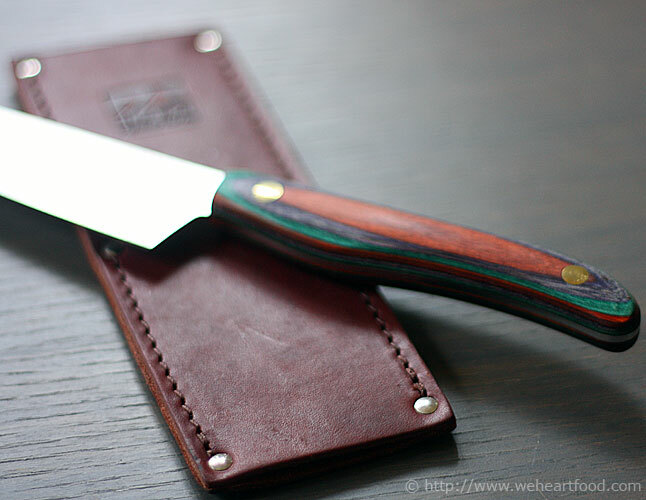 A few days after our initial correspondence, our knife arrived in the mail. (Isn’t it always exciting when a package arrives at your doorstep? It’s a little like Christmas.) There was a bit of reading material sent along with the knife, including a history of the company, their philosophy, etc., and I liked the fact that they encourage knife owners to send in the knives once in a while for a free “tune up” — resharpening and repolishing. But enough reading — I wanted to play with the new knife! The Petty is shipped with a leather sheath to protect the blade, and obviously your fingers — this thing is extremely sharp! After a few minutes of handling the knife, and using it to cut some veggies (Is there anything better than using a new sharp knife to cut a tomato?) I unfortunately came to the conclusion that it was a bit small for my hands — perhaps I’m just used to the grip I use on my chef knife, but I was continually hitting my knuckles on the cutting board. I asked Lisa to come in and give it a try, and lo and behold, she loved it. It was a perfect fit for her smaller hands, and she pretty much immediately declared the knife as “hers”. Now whenever Lisa is cooking in the kitchen, she’s using the Petty — she even brought it with her on a weekend trip to a mountain cabin a few weeks ago. 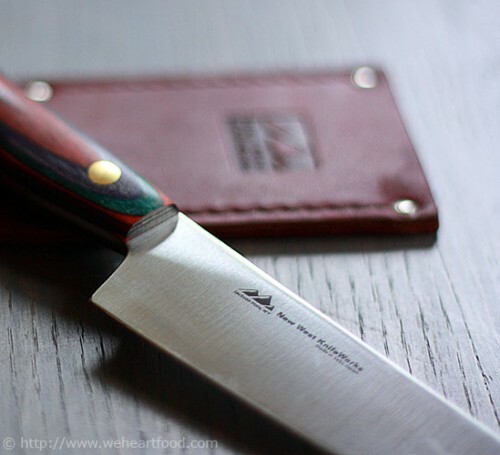 For me, I’ll be sticking with my beat-up chef’s knife (and one day checking out one of New West’s chef knives), but the Petty has become Lisa’s everyday knife. The cutting performance is great, and it just. looks. cool. Check them out here. One of the benefits of being a FoodBuzz Featured Publisher is the opportunity to sample new food finds. Recently we received in the mail this 1/4 box of chocolate from Cowgirl Chocolates, which included a delicious variety of truffles and caramels, ranging from ever-so-mild to holy-that’s-hot! If Cowgirl offered an “all spicy” box, I’d be all over it. 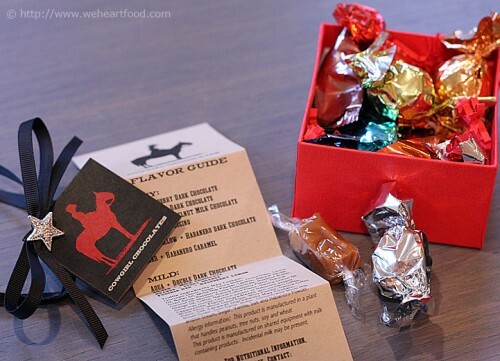 In any case, this little box would make a great gift to share with the chocolate-lover in your life. Actually, share it with the chocolate-hater in your life; you’ll get to eat more. A few weeks ago I was lucky enough to be “picked at random” in a drawing at The Kitchn … the prize? 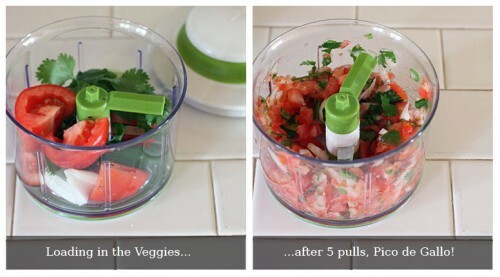 One of twelve VeggiChops, a hand-powered food processor from Chef’N. I wasn’t really sure from the pictures how this thing worked, but once you have it in your hands, it becomes pretty apparent. Also, it’s apparent that I need to clean the grout between our kitchen tiles. Yikes. The green ring at the top of the lid flips out and you pull it like you’re starting a lawnmower to rotate the blades within. The device itself is relatively small; you’re probably not going to use this to make salsa for a huge dinner party. Out of the box, there’s not many parts: the bowl, the lid with lawnmower pull, the rotating blades (with plastic guard — safety first! 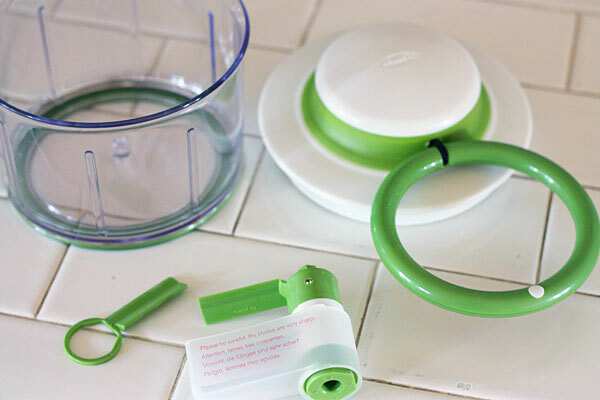 ), and finally a small ring you can place below the blades for use in chopping herbs — the ring has an arm that keeps the herbs high enough off the bottom of the bowl so they reach the blades. So how’d it work? I needed to make some pico de gallo for fajitas a few days ago, so I thought I’d put the VeggiChop to the test. One thing I always thought was odd with these devices is that you have to cut the vegetables to a certain size to fit them in the bowl in the first place, so why not just keep using the knife you already have out? Well, one benefit I found is that I didn’t end up with a bunch of tomato guts to clean up off the cutting board. Since I only had to quarter the tomatoes, not much pulp escaped. I placed the tomatoes, along with onion, cilantro, and 1/2 a jalapeño, and gave a pull. Hey, that was easy — it’s chopping! By the fifth or sixth pull, everything was at the size and consistency I wanted. Just added a little salt, pepper, and a squeeze of lime juice and I was good to go. It was the perfect amount for the two of us. So, it works as advertised. One drawback to doing everything at once is that all the pieces end up the same size: I usually mince my jalapeños in when I make pico de gallo, and here they were pretty good size chunks. I could see using this to quickly chop a bunch of vegetables for soups or stews; the lawnmower pull makes pretty quick work of things. 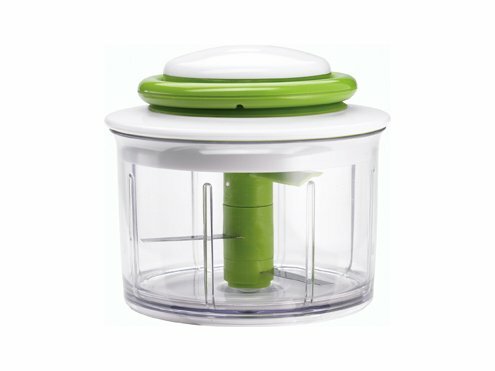 This would be great for someone who doesn’t have a lot of room in the kitchen — or hey, lower your carbon footprint by using this guy instead of an electric food processor! Are we going to do our quotes on this post? I wasn’t planning on it, why? Because I really like that pico! Okay, then, we’ll do the quotes. Well, I kinda just said everything I wanted to.